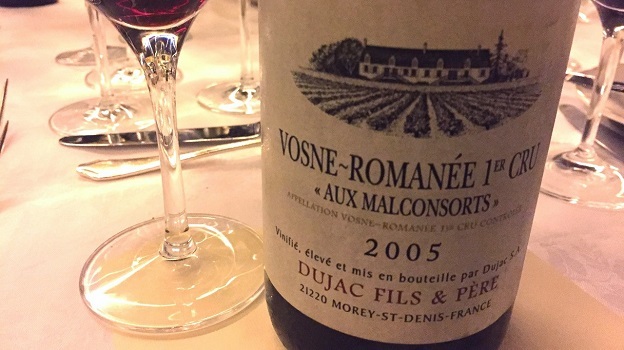 Dujac’s 2005 Vosne-Romanée Aux Malconsorts is just entering the early part of its drinking window, although it could use another few years to soften a bit further. Intense, bold and totally sensual, the 2005 is beautifully centered, with a poised core of fruit and plenty of floral and spice overtones that add nuance. All those elements build to a crescendo of flavors and textures that is quite impressive. Even so, my impression is that the wine has not yet fully arrived at its most expressive point. I very much like the wine’s breadth, volume and personality. Then again, I have long been fond of the wines from this Vosne 1er Cru. The Seysses family acquired their parcel in Malconsorts in 2005, when they teamed up with the De Montille family to buy the holdings of Thomas-Moillard. Because of the timing of the purchase, the 2005 was bottled under Dujac’s Fils & Père négociant label, although it is an estate wine, as are all subsequent vintages. 94/Drinking window: 2018-2035.